Working with raw food is something I had been wanting to learn for quite awhile now, but it’s so overwhelming to do research on the internet. With one search you can come up with thousands of informational links and it’s hard to sort through it all to get the most important information. 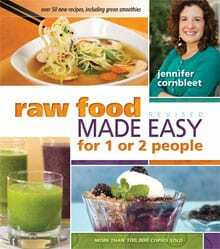 Jennifer Cornbleet has really made it easy by compiling everything in this easy to use cookbook. The best part about it is all the information it contains in the beginning. Cornbleet walks you through all the information you’ll need including where to find the ingredients for her recipes, all of the tools that you need, and how to soak nuts and seeds. There is even a list of all of the staples that you should keep stalked in your pantry along with the quantities you’ll need. She’s thought of everything. It’s easy to read which makes it easy to use. The recipes are also delicious. I’ve been making smoothies for years and they’ve never seemed quite right. Cornbleet’s trick is to add a banana with every combination of fruit and it really makes the difference. My smoothies went from dull to tasting like they came from a juice bar. And I never would have thought to make noodles from a zucchini, but it totally works for homemade ramen. There’s a recipe for just about anything you could hope for, broken down into categories so they’re easy to find. Make sure you have a food processor and a blender on hand. I found they are the two most commonly used items and it would be really difficult to make most of these without them. It’s a good investment though. Your body will thank you. Interesting! It sounds like an interesting read, to say the least… I am not sure I could ever follow a 100% raw diet, but I would like to incorporate some of the thoughts into my current diet. Looks interesting. I’ve got the food processor and blender, so I’ll definitely look into this. I have done some research online about Raw Food Diets because there are parts of it that interest me. I did know about adding a banana to every smoothie to give it a boost. Not sure that I would ever go completely Raw Diet but I could do 50/50 but that would do I don’t think..lol. I, too, want to try some raw food recipes, and this sounds like a great starting point. However, like another commenter, I need a blender! Would love a Vitamix or Blendtec! i have high blood pressure and i have heard that going raw vegan would help with that. seems like a really interesting book 🙂 would love to read it sometime. I would love to start eating better. I am very interested in readingthis book. Sounds good. My daughter in law is very into juicing and I bought her a juicer for Christmas. She loves it! It sounds interesting and a good idea. Great and delicious way to get in our fruits and veggies. Love the idea of this being a beginner’s book. Just what I need. Plus, adding a banana is easy and supposed to make things richer and creamier.